This eleven note set of Freenotes spans two octaves and is excellent for creating soothing and dreamy harmonies. Due to continuous instrument development, the design may vary from that shown. 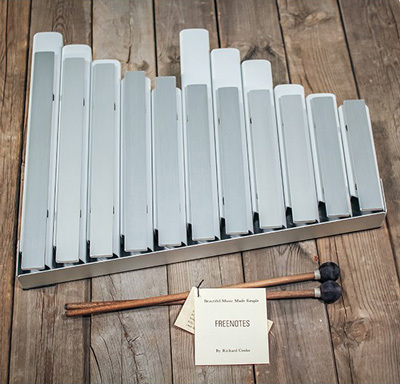 The Freenotes Wing employs a five-tone pentatonic scale, so all notes are in complete harmony. There are no wrong notes! No difficult techniques are required to produce their lovely tones — just a tap on the middle of the bar produces pure tones of consistent quality that sustain for over six seconds creating layers of soothing sound— players and listeners alike will be soothed and delighted by their pure tones. The Wing has been designed to be played in many different ways… place the Wing on a flat surface and you can play using one or two mallets… or hold the Wing in one hand while playing with the other. The Wing has been designed to require no maintenance. It will never go out of tune and the lacquered metal bars will not tarnish or stain. There are no moving parts to adjust. Like all Freenotes instruments, the Wing is built to last and is sturdy enough for even the most energetic children. The Wing is practically indestructible. Each Wing includes one pair of mallets. Size: 41 x 42 cm.